Day 5 finals at 2019 French Elite Nationals in Rennes. Béryl Gastaldello and Marie Wattel are battling for the second 100 free spot on France’s World Championships roster. 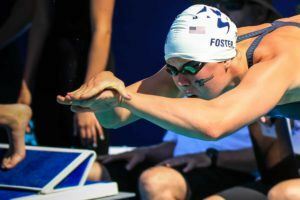 After unveiling their roster earlier this week for the 2013 World University Games, British Swimming will now be down by one to 10 members for that meet after Anne Bochmann pulled out on Tuesday night. Bochmann is battling an undisclosed illness, and there is no plan to replace her roster spot. Bochmann didn’t have a great World Championship Trials, but still managed to place 4th in the 200 free in 2:00.18. Her best times would have made her capable of medaling in either the 100 or the 200 freestyle. Maybe more significantly, when combined with Rebecca Turner and Caitlin McClatchey, Britain would have had a fantastic pair of freestyle relays that would have contended for medals. The UK only pulled in a single medal at the 2013 edition of the Summer Universiade: a gold from Jess Dickons in the 200 fly. Even with Bochmann’s scratch, this roster is capable of surpassing that total, especially on strengths of Olympians Antony James (fly), and McClatchey and Turner individually. Anne is one of the swimmers who were never the same after Dehli. Many people never recover from vists to India even as tourists.